Fraunhofer FOKUS developed and published within the European research project MyWay a multi-modal directions smartphone app, which enables efficient and comfortable forms of travelling. As part of the European research program “Smart Cities", Fraunhofer FOKUS investigates, develops and validates together with its project partners an integrated platform, the “European Smart Mobility Resource Manager", including cloud-based services and facilities to support community supplied information collection and processing. The purpose is to holistically address the efficient and seamless integration and use of complementary, capacity-limited mobility services in the overall urban travel chain, including all transport modes (motorised and non-motorised, EVs, public transport, flexible services such as transport on-demand) and mobility sharing schemes (e.g. car sharing, motorbike sharing and carpooling). The platform will be tested in three Living Lab demonstrations in Barcelona and Catalonia Region (ES), Berlin (DE), and Trikala (GR) involving local users and stakeholders. 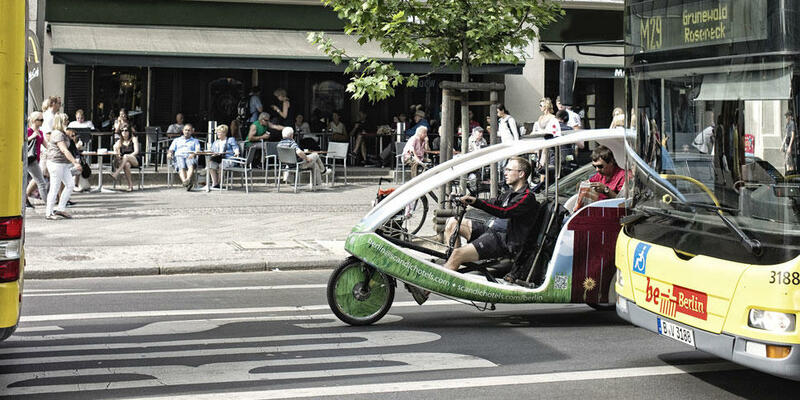 This approach gives priority to the egocentric vision of the user, finding the right compromise for each single traveller and offering a solution closest to his personal needs and preferences, making the frequent use of it (as an alternative to an ideal but not always practical solution) a main contribution to the sustainability of urban transport. The MyWay app can be downloaded in the iOS and Android app stores. Moreover, we will reward the most active registered users with great prizes, such as an action cam. You are invited to register at the MyWay portal. For more information, please visit us at the MyWay launch event in front of the TU Berlin Auditorium on Thursday, Oct 22nd, 10am - 3pm. Be part of the change!